Starting from Ketzin you will need a boating licence valid for your country of residence. This is not required if no licence is necessary to drive a similar boat in your own country. From our new base at Ketzin head for Berlin. The official capital of Germany since 1999, Berlin combines the ultramodern with old established landmarks, such as the Reichstag with its new glass dome, the Brandenburg Gate, the famous Tiergarten park, and the Museums Island. See Berlin from the 100 kilometres of canals that flow through the city, and soak up the city centre atmosphere. Moor in the heart of the tourist area at a number of overnight halts. More to the south and to the east, between the Spree and Oder find some of the best food in Germany. Please note that parts of this area of Eastern Germany do not have an extensive tourist infrastructure. Some maps and guides may only be available in German. 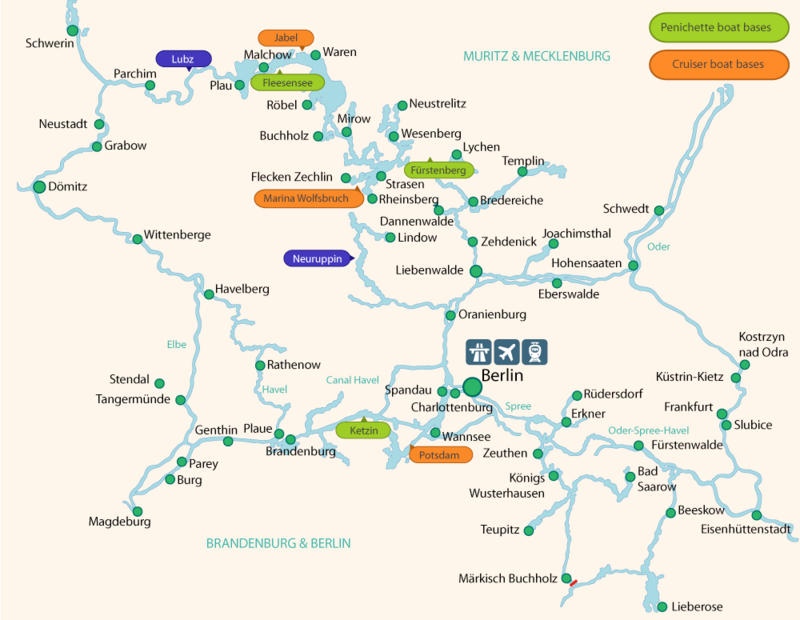 Ketzin - Spandau - Charlottenburg - Berlin centre - Erkner - Kopenick - Wannsee - Posdam - Ketzin. 234 km, 8 locks, 5h / day. 354 km, 8 locks, 4 h 30 / day. 340 km, 20 locks, 3 h 45 / day.